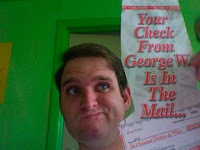 Your Check From George W.
Checks and direct deposits have started being made by the IRS to over 137 million Americans as of this week. The Economic Stimulus Package, as we have all heard by now, was approved by Congress and will give each individual who filed their taxes returns and made over $3,000 a $300 check or a $600 based on how much they paid in taxes. You can find out how much you will receive here and you can find out when you will receive it here. The system is based on the last two digits of your Social Security number, so if you are like me and your last two digits are 97 than you will receive your direct deposit by May 16th or your check by July 11th. As far as whether you will get direct deposit or a check, it will be the same as what you received when you filed your taxes. As you can see by this newspaper ad that my sister clipped out, local businesses are all over this. Good luck with your check, may you all stimulate your wallets and the economy.